Are you jetting off this Valentines Day weekend? Us lucky folks in the USA this year get this Hallmark day falling on a long weekend that coincides with Presidents Day on Monday. Plus my kids are on winter break for a week. YAHOO. I know many NY-er's are taking advantage of this to escape the winter blues. I am one of them! YAY. I'm ditching my boys for a week and off to a spa retreat to get pampered silly. I can't wait! You will have to find out where I'm going when I return. Sorry for the secrecy. I just can't divulge in case the paparazzi wants to track me down! JOKE. 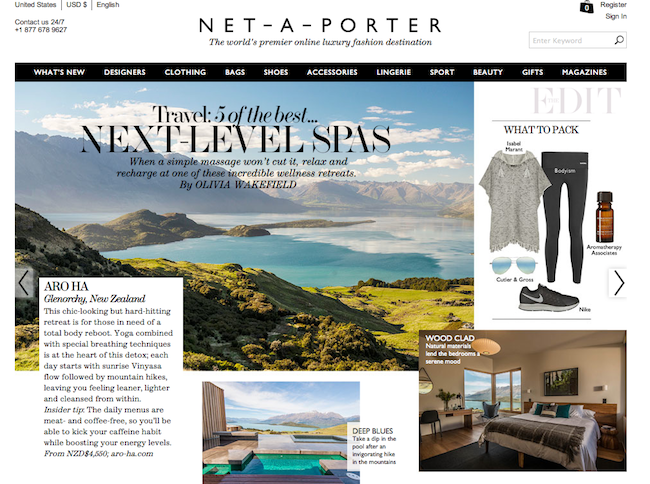 But for a hint it just so happens to be one of these places that was featured in this issue of Net-A-Porter magazine. I was surprised that my destination is on their list! Now I'm reassured that I made a good pick. This has me even more GUNG-HO. Do you need a winter blues pick up? Oh who am I kidding? Anytime of the year I'm up to visiting any of these retreats! I can always use down time. I'll NEVER say never to a sanctuary. When you have kids silence is golden!